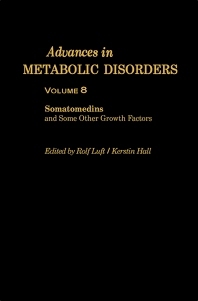 Advances in Metabolic Disorders, Volume 8: Somatomedins and Some Other Growth Factors covers the proceedings of the 28th Nobel Symposium held at Hasselby, Sweden on September 4-7, 1974. The book discusses the mechanisms regulating cellular growth; the purification procedures and biological properties of nonsuppressible insulin-like activity (NSILA-S); and physiologic and pharmacologic significance of NSILA-S as an insulin-like hormone and as a growth-promoting hormone. The text also describes the in vitro effects of growth hormone on cyclic AMP metabolism in the isolated rat diaphragm; the interaction of epidermal growth factor with cultured fibroblasts; and the localization, purification, mode of action, and physiological significance of fibroblast growth factor. Somatomedins are considered with regard to bioassays and purification, the mechanism of their production, and their biological action in vitro. The book further tackles growth regulation in cultures of embryonic rat fibroblasts by the serum factors S1 and S2, as well as the endocrine role of the thymus and its hormone, thymosin, in the regulation of the growth and maturation of host immunological competence. The text also encompasses the significance of cyclic GMP in the action of growth-promoting factors. Endocrinologists, biochemists, physiologists, and medical students will find the book invaluable. II. How Do Growth-Regulating Factors Work? IV. How Does Insulin Act to Lower Cyclic AMP Levels? V. How Might Cyclic AMP and Steroids Work to Control Cell Growth?